Al-Wadaani HA. 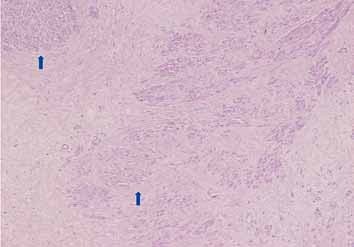 Anterior Abdominal Wall Leiomyoma Arising De Novo in a Perimenopausal Woman. Oman Med J 2012 July; 27(4):323-325. Human leiomyomas are quite common smooth muscle cell tumors that may cause bleeding or a mass effect on adjacent structures. They are one of the most common reasons for hysterectomies in women. These have been thought to be clonal tumors arising from a single myometrial cell.1,2 These tumors enlarge during reproductive years and regress later after menopause indicating a role played by estrogen in their genesis and growth. Treatment with agonists of GnRH, which inhibits gonadal function and decrease serum E2, has shown to produce a 40% to 60% reduction in the size of a leiomyoma. The leiomyoma reverses to its original size if the treatment with GnRH is discontinued.2 Treatment with steroids has also been shown to affect the long term results of such tumors.3 Deeply situated tumors are likely to be confused with a well differentiated malignant tumor while the superficial lesions are readily recognized as benign. A 45-year old obese multiparous of gravida 4 para 4 (G4P4), perimenopausal lady presented with a mass in the right iliac fossa of three years duration. She had a history of cholecystectomy 20 years ago and was on oral hypoglycemic agents for type 2 diabetes. She was not on steroids or hormone replacement therapy nor had history of gynecologic interventions. There was no history of seizures, mental retardation, behavior problems and there were no abnormalities of skin pigmentation. On examination, there was a smooth globular, non-tender, fixed pre-peritoneal mass within the anterior abdominal wall muscles overlying right iliac fossa which measured 20 × 20 cm. Overlying skin was normal and non-adherent to the mass. Computed tomography scan (CT) of the chest showed no abnormalities, however, that of the abdomen with oral and intravenous contrast revealed an oblong mass measuring 18 × 13 × 9 cm3 over the right iliac fossa within the anterior abdominal wall musculature, (Fig. 1). It demonstrated areas of hypodensity with no significant contrast enhancement or calcium deposit. The subcutaneous fat was intact and clean. Figure 1: CT abdomen with oral and I.V contrast showing an 18 × 13 × 9 cm3 oblong mass over the right iliac fossa within the anterior abdominal wall musculature (arrowed). There was no violation of the peritoneal cavity; and the intra-abdominal organs and the lymph nodes were within normal limits. A tru-cut biopsy of the mass was reported as comprising of fibro- vascular tissue with foci showing proliferating bands of spindly myo-fibroblastic cells with variable collagenous tissues. No mitosis or atypia was detected. However, she did not undergo transvaginal ultrasonography, MRI, or cytologic analysis. 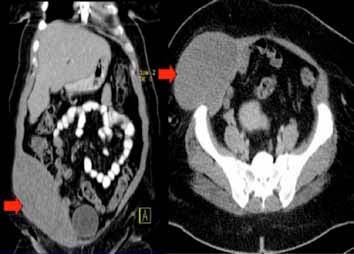 The patient was subjected to surgery and operative findings were that of a pre-peritoneal intramuscular encapsulated mass. The mass was excised totally along with adjacent healthy muscle fibers and overlying anterior rectus sheath. The defect could be closed primarily. 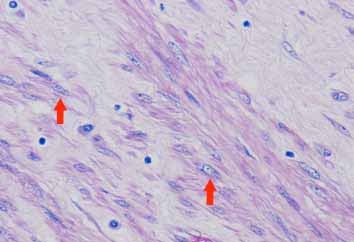 Figure 2: Mass showing bundles of smooth muscle with variable fibrosis (arrowed). Figure 3: High power showing typical cigar shape nuclei (arrowed) and eosinophilic fibrillary cytoplasm of smooth muscle cells. Figure 4: Positive staining with smooth muscle actin (SMA). Leiomyomas are common benign uterine tumors occurring in about 20% to 30% of premenopausal women.4 The incidence falls sharply in postmenopausal women as it is believed that hormonal changes assist spontaneous resolution of such tumors. Extra uterine leiomyomas are rare events usually occurs with seeding of myomatous tissues during previous gynecological surgeries more commonly with laparoscopic procedures.5-7 Origin of smooth muscle cell tumors in the anterior abdominal wall from the cells of vessel wall has also been postulated,8 especially in those receiving hormone replacement therapy. Leiomyomas originate from smooth muscle cells of the uterus and rarely from intestine or vessel wall. The alteration of such cells to leiomyoma involves somatic mutation and unknown synergistic action of hormones, deranged lipoid metabolism and local growth factors.1,2,4 Progesterone and insulin like growth factors have been implicated in leiomyoma transformation of a smooth muscle cell. Although lipo-leiomyoma arising from anterior abdominal wall without presence of aforesaid factors have been reported in a case earlier,2 isolated leiomyoma arising de novo in the anterior abdominal wall muscles has not been reported so far. Moreover, it has been recently found that adiposite may enhance the proliferation of human leiomyoma cells via TNF-α proinfalamatory cytokine that is associated a proliferative gene profile in human uterine leiomyoma cells and may play a role in initiation and/or progression of uterine leiomyoma (HuLM) cells.8 The main differential diagnosis of leiomyoma of the abdominal wall includes well differentiated tumors arising from fat cells, fibrous tissue, and muscle or mesothelial cells. Majority of such tumors are benign. Malignant transformation of smooth muscle tumors have been reported especially in the disseminated variety.9 The diagnosis of de novo leiomyoma of the anterior abdominal wall can only be made when there is no history of previous abdominal surgery, open or laparoscopic, ever because the appearance of leiomyomas are known to occur in scars as old as 30 years.6 In cases where a smooth muscle leiomyoma has been removed previously irrespective of the route, seeding of the scar has been known to give rise to formation of the tumor later in life. Parasitic leiomyomas have been reported in the retro- or pre-peritoneum. It has been proposed that the uterine mass becomes adherent to these structures, develops its own blood supply and gradually over the time it loses attachment with the organ of origin, thus developing as a ‘parasite’ at the new location.10,11 This case is unusual as there are neither antecedent gynecologic complaints nor any history of gynecologic surgery in the patient. The only surgery she underwent was a cholecystectomy 20 years prior to her present complaints. Whether a cholecystectomy can give rise to seeding of a leiomyoma away from the incision site on the anterior abdominal wall is a moot point. If it had arisen in the previous scar, it could have been said, for arguments’ sake that smooth muscle cells from the ducts have been implanted in the scar. So far we have not come across any literature to support our hypothesis of seeding of smooth muscle cell from the biliary tree. Every effort should be made to remove the tumor en-block and avoid morcellation to prevent the seeding/recurrence of the tumor. In case of a large defect arises after excision of tumor, synthetic mesh can be used to provide immediate wound cover. 1. Porter KB, Tsibris JC, Nicosia SV, Murphy JM, O’Brien WF, Rao PS, et al. Estrogen-induced guinea pig model for uterine leiomyomas: do the ovaries protect? Biol Reprod 1995 Apr;52(4):824-832. 2. Lalor PF, Uribe A, Daum GS. De novo growth of a large preperitoneal lipoleiomyoma of the abdominal wall. Gynecol Oncol 2005 May;97(2):719-721. 3. Stewart EA, Friedman AJ. Steroidal treatment of myomas: Preoperative and long term medical therapy. Semin Reprod Endocrinol 1992;10:344-357 . 4. Ostrzenski A. Uterine leiomyoma particle growing in an abdominal-wall incision after laparoscopic retrieval. Obstet Gynecol 1997 May;89(5 Pt 2):853-854. 5. Moon HS, Koo JS, Park SH, Park GS, Choi JG, Kim SG. Parasitic Leiomyoma in the Abdominal Wall after Laparoscopic Myectomy. Fertil Streil. 2008 Apr 12. Epub Ahead of Print. 6. Kumar S, Sharma JB, Verma D, Gupta P, Roy KK, Malhotra N. Disseminated peritoneal leiomyomatosis: an unusual complication of laparoscopic myomectomy. Arch Gynecol Obstet 2008 Jul;278(1):93-95. 7. Schindle M, Birner P, Losch A, Breitenecker G, Joura EA. 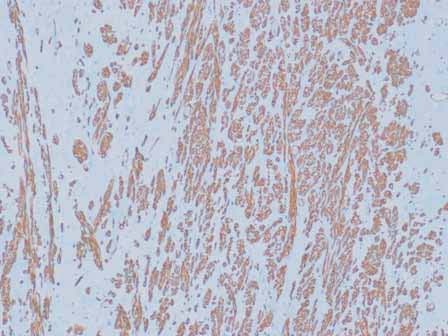 Preperitoneal Lipoleiomyoma of the Abdominal wall in a postmenopausal woman. Maturitas 2001;30:189 . 8. Nair S, Al-Hendy A. Adipocytes enhance the proliferation of human leiomyoma cells via TNF-á proinflammatory cytokine. Reprod Sci 2011;8(12):1186-1192 . 9. Wada Hiraike O, Yamamoto N, Osuga Y, Yano T, Kozuma S, Taketani Y, Aberrant implantation and growth of uterine leiomyoma in the abdominal wall after laparoscopically assisted myomectomy. Fertil.Sterilit. 2009;92(5):1747.e13-1747.e15. 10. Yamaguchi T, Imamura Y, Yamamoto T, Fukuda M. Leiomyomatosis peritonealis disseminata with malignant change in a man. Pathol Int 2003 Mar;53(3):179-185. 11. Berhan Y, Isehak A, Legesso S, Tsegaye B. Pseudo-Meig’s syndrome: parasitic leiomyoma with ascites in a 52-year old lady. Ethiop Med J 2003 Oct;41(4):363-366.